A while ago I tried something new with crochet... I made a collar! It was much more simple than I thought it would be. You can find the pattern HERE for free. This is so cute!!! I love how it's vintage looking, and yet it's so modern and chic. Thanks for stopping by Dolly Creates. This is so pretty! I have seen that pattern before and considered making it. I think it looks really nice with the two shirts you paired it with. wow I cant imagine being able to make something like that! Thanks for stopping by my blog. Thought I would return the comment love. This collar looks so cute on you! I'll be following you via bloglovin! Your making me wish I can crochet! Love it Elise! 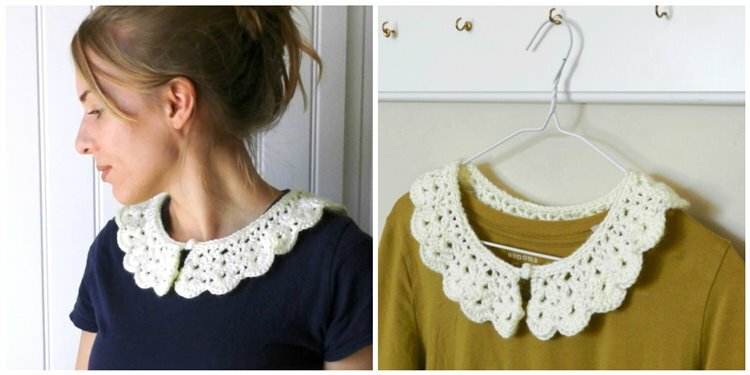 The peter pan collar this way makes it all the more desirable! Thanks for visiting my blog too! I love, love, love it! I wish I knew how to crochet! Mmm I might just try this out...have a grey dress that begs for something round the collar and I've been wondering whether a crocheted collar would do the trick. This is really cute. You can definitely pull off this look! This turned out adorable! I love it! I love it! You look lovely in it, too, but I totally am with on the comfy pants all day thing.